For my mom’s birthday I treated her to concert tickets. The concert was in New Hampshire, so Teddy and I decided to take advantage of that opportunity and spend the day hiking in some beautiful weather. We hiked Pact Monadnock – an easy, relaxed hike that was just what we were looking for that day. The weather has started to get quite cold so we didn’t want a long trek, but enough to get the blood flowing. This was perfect. It only took us about 1.5 hours to make it to the top and we were treated to beautiful views. We could even see the Boston skyline – how cool is that?! After our hike we headed into Peterborough, where the concert was located. We met my family for dinner before heading over to the theater. 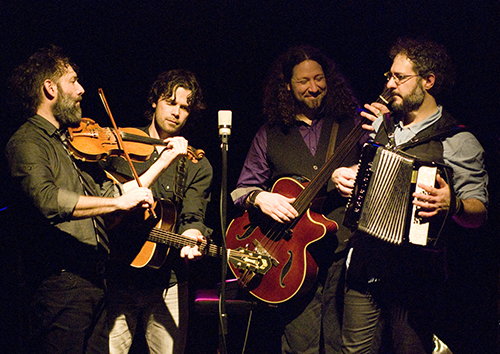 We were treated to an awesome night of music from Le Vent du Nord, a band from Quebec. It brought back memories of my time living in Montreal, that’s for sure. The band has amazing energy, and they played several pieces from their new album, Tetu. I was also lucky enough to win a copy of it! Weird and random, but I’ve been listening to the album in my car ever since and have been loving it! I’m already looking forward to the next time they’re in New England.